Situated in the shadow of Liverpool and Everton football grounds, themselves there since the later Victorian period, Anfield cemetery is even older having been taking in burials for over 150 years. By the middle of the 19th Century Liverpool’s graveyards were reaching saturation point and in 1854 the Corporation prohibited any more burials in the centre of the town. The new cemetery at Anfield was designed by Edward Kemp and building work began in 1861 with the first burial taking place two years later. The total cost of the project, including purchase of the land, was £150,000, equivalent to £16 million today. The cemetery is laid out in a diamond shape with four entrances and axial paths that run north-south and east-west. Liverpool architects Lucy and Littler designed the lodges, chapels and entrance gates.Only one chapel, originally for Nonconformists, remains and this is now unused and on the Heritage at Risk Register. The crematorium was opened in 1896 and was the first in Liverpool and only the fourth in the United Kingdom. Four recipients of the Victoria Cross are buried in Anfield Cemetery, including John Kirk who was awarded one for gallantry in the Indian Mutiny of 1857. He died aged 38 in 1865, having fallen into poverty following a discharge from the army due to having contracted rheumatism which in the opinion of the Inspecting Medical Officer was ‘the result of, or aggravated by, the use of intoxicating liquors, or indulgence in other habits or vices.’ Kirk had been punished twelve times for being drunk on duty, going AWOL and escaping from barracks cells. The cemetery contains a mass grave containing the remains of over 500 residents of Liverpool who were killed during the May Blitz of 1941. There are over 900 British servicemen from the two world wars buried in the cemetery as well as 67 from other nations, m ainly Dutch and Norwegian seamen. Notable local people buried in Anfield Cemetery include Thomas J Hughes, founder of the T J Hughes chain of shops in 1925; Michael J Whitty, former Chief Constable of Liverpool and founder of the Daily Post newspaper in 1855; shipowner Sir Alfred Lewis Jones, who opened the Liverpool School of Tropical Medicine in 1898 and whose grave is pictured left. Also buried here are Victorian boxing champion Jem Mace and singer Michael Holliday, whose song ‘Starry Eyed’ was the first number one of the 1960s. Near to the Cherry Lane entrance is a grave containing the remains of husband and wife William and Julia Wallace, who were at the centre of a classic ‘whodunnit’ in 1931. On 20th January that year Julia was found battered to death at her home in Wolverton Street by William, an insurance agent. He was later charged with murder after police concluded he still had time to carry out the killing and then create his alibi, that he was in Allerton looking for an address that did not exist. After being found guilty by a jury he wa s sentenced to death but the conviction was overturned by the High Court as the verdict had been reached against the weight of evidence. Just two years later William died of renal cancer and was buried alongside his wife. Being so close to Anfield and Goodison Park football stadiums, it is not surprising that a number of notable people connected to the early years of the Liverpool and Everton clubs are buried there. William E Barclay holds a unique place in Merseyside football history as the only man to manage both clubs. He combined these roles with that of headmaster at an industrial school in Everton Terrace, off Netherfield Road South. He later drifted into obscurity and was found dead in tragic circumstances in 1917, an inquest returning a verdict of suicide during temporary in sanity. His final resting place in Anfield cemetery remained unmarked over ninety years but due to the sterling work of local football historians a stone was placed on it in 2013. Barclay had remained loyal to Liverpool FC founder John Houlding after the acrimonious split within the Everton membership in 1892. However local solicitor George Mahon was instrumental in Everton’s move away from Anfield and arranged the purchase of the land that became Goodison Park, after which he became the club chairman. He lived at 86 Anfield Road and was buried in Anfield cemetery after his death in 1908. Liverpool FC’s longest serving manager was Tom Watson, who too k over from William E Barclay in 1896 and guided then club to two league titles and their first FA Cup final. He died in May 1915 and his funeral at Anfield cemetery was attended by many leading figures from the game in which he was held in high regard, having also won honours with Sunderland. In May 2015 a headstone was re-erected on his grave after family members were traced. Anfield cemetery remains open to burials today. A charity, the Friends of Anfield Cemetery, has been founded with the aim of removing it from the Heritage at Risk Register by 2025, as well as building a heritage and visitor centre whilst remaining mindful of the fact it is a working cemetery. A Kerb set can add distinction to your loved one’s grave, giving it a beautiful marked border in addition to the headstone, as well as keeping the area around it tidy. In Merseyside, only Liverpool City Council allow kerb sets to be added to gravestones and a condition is that they must match the material of the existing memorial. Once the kerb set has been installed, it can then be covered with a cover slab or alternatively be filled in with chippings that come in a range of colours. In recent years, it has become common to fill the centre with soil for planting seasonal flowers, or for the infill area to be covered in astroturf. A grave bordered by a kerb set is much better protected against the elements and the infill area can be used to place further memorials such as flowers, vases, toys or other personal items. The kerb set prevents people from walking over where your loved one is buried and can also make a grave easier to maintain as there is less likelihood of weeds. Kerb sets provide a distinctive final resting place for your loved one and can also be used on the graves of cremated remains. Sarsfield Memorials have a range of kerb sets available and a sample can be viewed here. We can provide combined headstone and kerb sets, or as an addition to an existing grave, a kerb set can be added providing the material is the same and the size required is within the regulations. You will sometimes s ee older graves in cemeteries that have kerb sets which appear in poor condition. This is often because they have shifted due to ground movement over the years, but you do not need worry about this nowadays. All our kerb sets are fitted on a one piece reinforced concrete foundation which is in line with NAMM (National Association of Memorial Masons) recommendations and are fixed by our skilled craftsmen. Before installing your kerb set permission must be granted by Liverpool City Council which we can arrange for you. There is a fee for this which is currently £90 and Sarsfield Memorials can process the payment of this for you. Please get in touch with us if you would like any further information and we will be happy to discuss your requirements. Vandalism or accidental damage to headstones can be costly to repair. Graffiti, falling trees, subsidence and lawnmowers are examples of how gravestones can suffer damage, whether it be accidental or wanton. Peace of mind is available though with Stoneguard, which has been the leading headstone insurance policy for over thirty years. Sarsfield Memorials can value the memorial and set up the policy, including issuing a Certificate so you have immediate cover. We will do all the paperwork and correspondence with Bridge Insurance Brokers who are underwritten by Royal Sun Alliance, with cover available for as little as £5.60 per year renewable every five years. Claims are processed and repairs or replacement carried out to get your loved one’s gravestone back to it’s original state as quickly as possible. Stoneguard’s policy is a straight forward ‘all risk one’ in that you can not choose to insure against certain causes of damage but not others. It covers damage to your headstone caused by storms, accidents, vandalism, subsidence and falling trees, allowing for replacement if necessary. It also provides personal liability of up to £2 million for any injuries caused by your headstone to members of the public but there are exemptions in respect of the insured and certain family members. The insurance policy does not cover wear and tear and damage to the headstone appearance caused by sunlight, weathering, nuclear incidents, terrorism or acts of war. Premiums are available for headstones in all UK cemeteries and churchyards and are based on the value of your headstone, with no variations according to your geographical region. For gravestones up to the value of £400, cover costs £28 for five years, while a headstone valued at £751-1000 costs £59 and for a memorial worth £2501-3250 it is £167. For any gravestones that have a higher value than this, please call Sarsfield Memorials on 0151 228 5616 for a quote. A full list of premiums up to the value of £3250 can be found here. When you buy a headstone from Sarsfield Memorials we will always advise on how to keep it clean and what to use. If you are looking to clean an existing gravestone, we are happy to give free advice along with a no obligation quote for us to do the work if you change your mind about doing it yourself. To the man on the street, cleaning gravestones appears to be a very simple and easy task, thanks to all the wonderful cleaning products that are available on the internet from Ebay and Amazon and on the high street. However nothing could be further from the truth! Sandstone is a sedimentary rock, granite is igneous, marble and Portland stone are metaphoric and slate is a fine-grained, foliated and homogeneous metamorphic rock. All these natural materials will retain products that are rubbed in or brushed on because they reflect the weather at the time they are applied. Whether damp or dry, the chemicals will react with the material in different ways and will cause deterioration of the stone. Unless you know and understand the geology of the material your headstone is made from, we would never advise a family to clean a memorial using chemicals. Instead just use water and a soft sponge. The atmospheric agents and retail chemicals (cleaning products) will particularly affect memorials erected close to main roads. Limestone and marble headstones will crystalise and be eaten away. The material over time will become more rough and this will attract more dirt and grime, making the gravestone more delicate. Do not ever use anything abrasive on any headstone as you could cause damage that cannot be repaired. Lettering can also be dama ged by cleaning a memorial. Leaded letters can change colour depending on the chemicals used, while painted and gilded letters can be damaged and possibly eradicated, which then means extra cost to you as you will need to instruct a Monumental Mason to rectify the problem. Please be very cautious, we would not advise anyone to clean their own headstone. Make the correct decision when extending the life of your memorial and remember it is always cheaper to have a gravestone professionally cleaned by a Monumental Mason than to replace it. 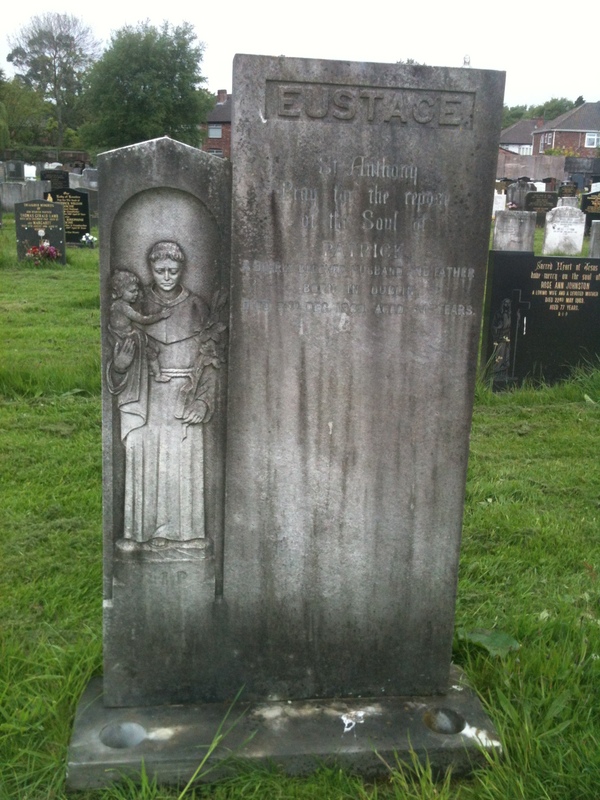 At Sarsfield Memorials we have skilled craftsmen who can restore just about any gravestone to a near new appearance no matter what the material is, as the before and after photos on this page show. This service is available throughout the North West and examples of before and after cleaning are shown in the photographs accompanying this article. If you contact us we will be happy to discuss your requirements and give a free no obligation quote.